I really want frames to represent seconds but how? By watching a video I learned that doing CTRLT should do what I want but that didn't work. Because seconds are like 25 frames but if every frame was a second that would be cool. Go to the Properties window, then in the Render tab scroll down to the Dimensions section. The Frame Rate is the setting you want to change. 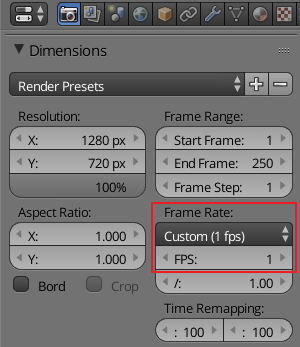 From the dropdown choose "Custom" then in the new frame rate field that pops up enter 1. Not the answer you're looking for? Browse other questions tagged video keyframes frame-rate or ask your own question. Blender VSE - import multiple rendered PNG frames? Can I increase the number of frames in an rigid body simulation?